Bass & Reiner Gallery is pleased to present Thinking of You, featuring work by Bean Gilsdorf and Ray Mack, with a special contribution from Marshall Elliott. Inspired by these artists insistence on American history as a source of content, this exhibition explores reference, appropriation, and allusion. Integrating recognizable historical elements, they transform the source material from well understood cultural documents to ambiguous markers of a contemporary moment. The material is the past but the product is the present. Deploying segments of 18th and 19th century paintings together with geometric colored forms, Gilsdorf’s flags point to the material grammar involved in constructing national identity. At once kitsch and imprinted with a patriarchal bourgeois sensibility, the series acts as a sidelong reflection of faded traditions. Recycling scenes and subject matter from classic American painters such as Charles Willson Peale and Norman Rockwell, Mack reinvigorates their traditional subject matter with a new urgency. 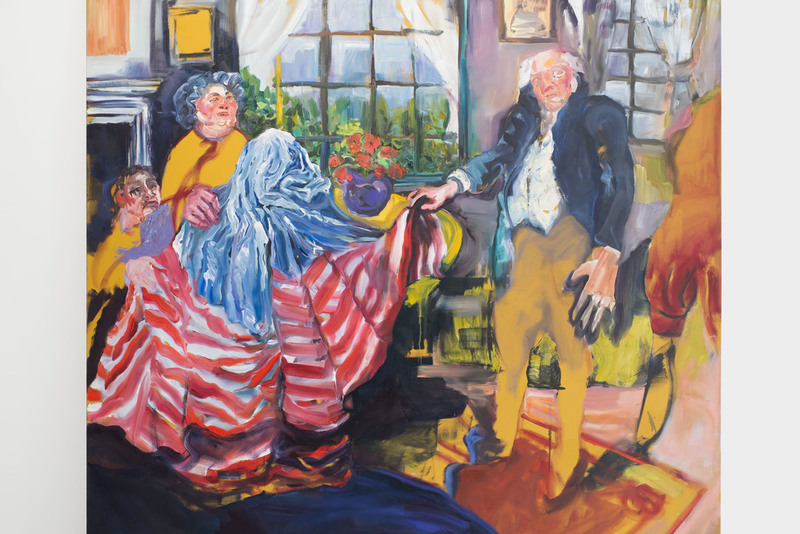 As Renaissance painters borrowed their compositions and content from those of their predecessors, Mack borrows hers from these American masters, both honoring and complicating the legacy of vernacular American painting. Responding to the themes of the exhibition, Marshall Elliott has produced a limited edition print that will be available in Bass & Reiner’s flat files. Bean Gilsdorf’s art practice mines the ideology of images. Combining pictures appropriated from mass-market American history books with the techniques of collage, Gilsdorf creates objects, videos, and installations that explore historical orthodoxy and the conventions of representation. Gilsdorf received her BA from Simon’s Rock at Bard College and her MFA from the California College of the Arts. Her work has been included in exhibitions at the Wattis Institute for Contemporary Arts, San Francisco, CA; the American Textile History Museum, Lowell, MA; and the Holter Museum of Art, Helena, MT; as well as exhibition spaces in Poland, England, Italy, China, and South Africa. She has received grant support from the Banff Centre and the NW Film Center of the Portland Art Museum. Gilsdorf is currently a 2015-2016 Fulbright Fellow to Poland. Ray Mack grew up weird in the small town of Ellensburg, Washington. She received her BA in Studio Arts from Bard College and her MFA in Painting from the San Francisco Art Institute in 2012. Her work has been exhibited and published both internationally and nationally. She currently lives and works in Seattle, Washington. Mack has exhibited at Punch Gallery, Seattle, WA; The Lab, San Francisco, CA; S.H.E.D Project, Oakland, CA; the Clymer Museum, Ellensburg, WA; and the Zimmer Gallery, Tel Aviv, Israel. Marshall Elliott received his Bachelor’s Degree in Film Studies and English Literature at the University of Colorado, and his MFA in Sculpture at the San Francisco Art Institute, where he was awarded the Anne Bremer Prize. In addition to numerous San Francisco-area spaces such as The Headlands Center for the Arts and the Jules Maeght Gallery, he has shown work in Colorado, Oregon, Chicago, Nebraska, Puerto Rico, and will be an artist-in-residence at the deYoung museum Artist Studio Program in 2017. He currently lives and works in Oakland.